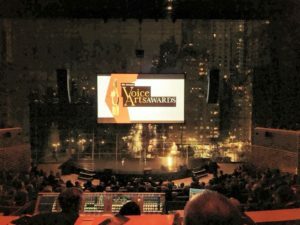 Chuck and Stacey, producers and hosts of VO Buzz Weekly, took home their 4th consecutive win at the 2017 Voice Arts Awards in NYC for Outstanding Voiceover Podcast. They are the only category to win four years in a row at the VAA’s. While they could not be in attendance due to a prior family commitment, presenter and friend Dave Fennoy gave the stage to their pal Joe Cipriano who relayed Chuck and Stacey’s gratitude and accepted the beautiful gold statue on their behalf.